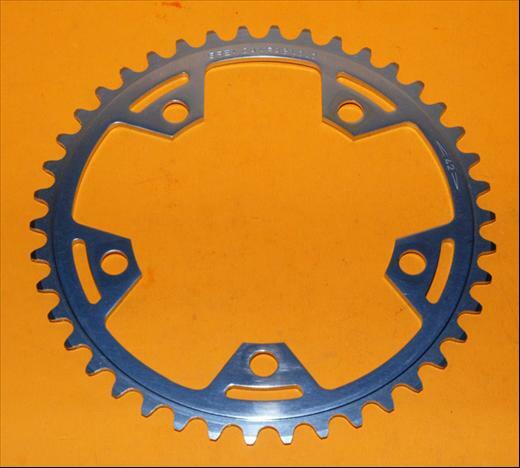 Chainring design used on the Camapgnolo Gran Sport triple, Victory and Triomphe groups. Details: The Victory group was introduced in 1985, the Triomphe group first appeared in Campagnolo catalogs in 1986. Both groups were discontinued in the late 1980's and replaced with Athena and the new wave of Campagnolo mid-range groupsets. Triomphe and Victory were designed not only as a mid-level component but also as a legacy design to those that preferred the old Gran Sport / Nuovo Record (=> Triomphe) and Nuovo Record / Super Record (=> Victory) designs over the new C-Record.